Looking for a perfect gift idea for anyone on your list? 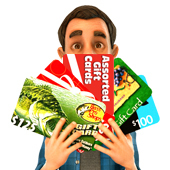 Food City's gift card center, located in every store, has a huge selection of cards from restaurants, department stores and specialty shops, plus phone cards and rechargeable credit cards. There are even cards from your favorite local businesses! Simply select the cards you want and activate at checkout. They'll love the meaningful gift and you'll love the convenience. Checking your Food City Gift Card balance is easy! Simply log into your Food City account click the My Account tab, select Gift Cards and enter the number on the back of your card. Earn Bonus ValuPoints with the purchase of select shopping and dining cards. Earn 2x ValuPoints for every $50 in qualifying gift cards purchased in a single transaction. Excludes Food City store gift cards, Visa®, Mastercard® and American Express® gift cards, prepaid wireless, phone cards, and reloadable prepaid products.